While families struggle with how to afford a college degree, colleges themselves puzzle over how to help high-achieving students and put their minds at ease when it comes to paying for higher education. Hendrix College’s answer is simple. Meeting the full demonstrated financial need for every qualified student. Announced today, the new Hendrix Advantage Plus program is a national expansion of the popular Hendrix Arkansas Advantage. The Arkansas Advantage, announced in 2014 for freshmen entering in fall 2015, benefited 160 students that fall (40 percent of the freshman class), with an average aid package of nearly $40,000 in grant aid alone, not including loans or work-study. The expanded aid program extends the Advantage to any student with at least a 3.6 GPA and an ACT score of 26 or higher or an SAT score of 1230 or higher. Hendrix Advantage Plus will meet students’ demonstrated financial need through all forms of financial assistance, including merit scholarships, need-based grants, federal and state grants, federal student loans and student employment. Every year, Hendrix earns top honors in national higher education rankings. U.S. News & World Report consistently cites Hendrix in several categories, such as “Most Innovative,” “Best Value Schools,” and its list of colleges most recommended by high school counselors. This year, Hendrix was ranked 76th among the country’s top national liberal arts colleges – making Hendrix the highest ranked national liberal arts college not only in Arkansas but also in Texas and much of the south central United States – featured in the U.S. News rankings. To be considered for the Advantage Plus program, students must simply apply for admission to Hendrix and complete the Free Application for Federal Student Aid (FAFSA). Advantage Plus is available to freshmen enrolling in fall 2019. For more information on Hendrix Advantage Plus, call the Hendrix Office of Admission and Financial Aid at 501-450-1362 or visit www.hendrix.edu/advantageplus. Hendrix College has once again been featured in the U.S. News & World Report “Best National Liberal Arts Colleges” rankings. The College placed #76 on the 2019 list, consistent with its ranking for 2018. The Hendrix Players present Driving, a play by Hendrix alumnus Werner Trieschmann ’86, as the Fall Family Weekend production for 2018. Performances are set for Friday, September 21 at 6 p.m. and Saturday, September 22 at 2 p.m. and 6 p.m., in Cabe Theatre on the Hendrix campus. Admission is free, and the public is invited. Seating will be first-come, first-served. A family-friendly play that may hold particular interest for teens because of the lead character’s age, Driving tackles the process of searching for the courage to do something you should be able to do — and succeeding. Nothing seems to be able to put the brakes on Ginny, an almost 16-year-old girl with straight A’s and a bright future in front of her. However, learning how to drive appears to have stalled her on the side of the road. Nobody who knows her can figure out why she flunked her written driver’s exam. Instead of getting behind the wheel, she pins her hopes on computer-driven cars controlled by robots with British accents and oh-so-friendly ride-sharing services. Instead of being independent and free, Ginny is driven around by her mom, who drives like a NASCAR racer with anger issues, or her goofy father, who pokes around slow as a turtle while waving at random gas stations. Then there is Ginny’s odd dream of being chased by zombies, and her only chance for escape is to get behind the wheel. Will Ginny finally overcome her issues and start Driving? A writer, director, and theatre instructor, Werner Trieschmann wrote and directed the world premiere production of Mozart: Revealed and Schubert: Revealed with the Fort Wayne Philharmonic in Fort Wayne, Ind. His numerous plays have been produced across the United States, Canada and, most recently, England, Australia, and Japan. His plays, including Failing the Improv, You Have to Serve Somebody, and Disfarmer, have been staged by Moving Arts in Los Angeles, Ensemble Studio Theatre in New York City, The New Theatre in Boston, Mobtown Players in Baltimore, and Arkansas Repertory Theatre in Little Rock. His full-length comedy, You Have to Serve Somebody, is published by Dramatic Publishing, and his plays Failing the Improv and It’s Not You, It’s You are published by Playscripts. His monologues have appeared in The Best Women’s Stage Monologues 1999 and Audition Arsenal for Women in Their 20s, published by Smith & Kraus. 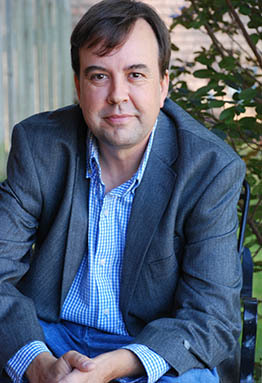 In 2013, Trieschmann received an Arkansas Arts Council Individual Artist Fellowship in Literary Arts: Playwriting. His play Lawn Dart won first prize in the Contemporary Arts Center of New Orleans New Play Competition. He was the first playwright to receive the Porter Prize, an Arkansas literary award recognizing outstanding achievement by an Arkansas writer. He holds an MFA in playwriting from Boston University. He is married and has two young boys, who are wilder than wild. Raven Edens ’22, Peter Grant ’21, and Elliot Jackson ’22 as Assistant Stage Managers/Zombies/Police. A new textbook by Dr. Duff Campbell, professor of mathematics and computer science at Hendrix College, was published this summer by the American Mathematical Society. Campbell designed An Open Door to Number Theory as a textbook for a junior-level course in number theory. “I started writing it as a set of lecture notes in 1994, and it developed into a book over many years,” he said. As with his lectures, Campbell aimed for the book to have an informal, engaging style. Its approach emphasizes geometry and big concepts to provide a natural lead-in to the study of algebraic number theory, and Campbell worked to develop a balance between calculations and proofs in the exercises the book offers. An Open Door to Number Theory underwent a review and refinement process in classrooms for the past several years. Campbell has used various versions of the book’s material in classes at Hendrix College, and mathematics faculty at St. Olaf College, the University of Hawaii, and Western New England University have done the same. In addition, Hendrix student Olivier Kwizera ’17 undertook a special project his senior year, working with Campbell to write a complete Solutions Manual that is now available to instructors who use the book. Campbell, who lives in Little Rock with his wife, Beth Levi, and their two children, dedicated the book to his grandfather, LeRoy Archer Campbell. He followed in his grandfather’s footsteps by attending Harvard College as an undergraduate, earning his Ph.D., becoming a college professor, and producing a book. The project carries another family connection, too: Campbell’s sister, Kristin McCullough, contributed the cover photograph, which she took in Ireland. An Open Door to Number Theory may be purchased on Amazon. 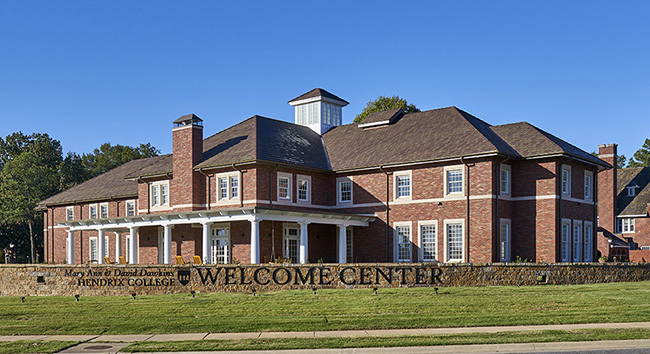 Hendrix College’s Mary Ann and David Dawkins Welcome Center, which opened last fall at the intersection of Harkrider and Winfield Streets, has been rated LEED Certified by the Green Building Certification Institute. Dr. Tyrone Jaeger, Arkansas fiction writer and associate professor of English-Creative Writing at Hendrix College, is the recipient of the 2018 Porter Fund Literary Prize. The Porter Prize is presented annually to an Arkansas writer with a substantial and impressive body of work that merits enhanced recognition. Past winners of the Porter Prize include Mara Leveritt, Morris Arnold, Kevin Brockmeier and Jo McDougall, the Poet Laureate of Arkansas. The $2,000 prize makes it one of the state’s most lucrative as well as prestigious literary awards. Eligibility requires an Arkansas connection. Jaeger will be honored at an award ceremony at 6:30 p.m. Thursday, October 11 at the Main Library’s Darragh Center in downtown Little Rock. The Porter Prize and the Booker Worthen Literary Prize will be given out in the same evening. The event is free and open to the public. The Porter Prize was founded in 1984 by novelist Jack Butler and novelist and lawyer Phil McMath to honor Dr. Ben Kimpel. Butler and McMath were students of Kimpel, noted professor of English at the University of Arkansas at Fayetteville. At Kimpel’s request, the prize is named in honor of Kimpel’s mother, Gladys Crane Kimpel Porter. The annual prize, $2,000, has been given to 34 poets, novelists, non-fiction writers and playwrights. Jaeger was notified of his award by Little Rock novelist Trent Lee Stewart ’92, the 2008 recipient of the Porter Prize. Tyrone Jaeger is the author of the story collection So Many True Believers and the cross-genre novella The Runaway Note. His writing has appeared in the Oxford American, Southern Humanities Review, The Literary Review, descant, Southeast Review, PRISM International and elsewhere. He is the recipient of the Frank O’Connor Award for Short Fiction and the Theodore Christian Hoepfner Award. As an undergraduate, he attended Rollins College, and he received his Ph.D. from the University of Nebraska-Lincoln. He has been a member of the faculty at Hendrix College since 2008. Born and raised in the Catskill Mountains, Tyrone lives on Beaverfork Lake, Arkansas, with his wife and daughter. Hendrix College has received a $1 million gift from the Roy and Christine Sturgis Trust of Dallas, Texas. The award will support the completion of the College’s athletics facilities master plan, according to Acting President W. Ellis Arnold III. Hendrix is completing its new 1,500-seat Young-Wise Memorial Stadium, an indoor tennis center, and a sports training facility at the north end zone of the stadium that will serve Hendrix athletes. Total cost for the three facilities will be approximately $6 million. “The Roy and Christine Sturgis Charitable Trust is excited to award Hendrix College a grant to help complete its wellness and athletics master plan,” said Robert R. Fox, associate vice president and philanthropic relationship manager for U.S. Trust, Bank of America Private Wealth Management, on behalf of the Sturgis Trust. The 18,000-sq.-ft. sports training facility will bear the Sturgis name in recognition of the Sturgis Trust’s support, Arnold said. The $1 million gift is the largest award Hendrix has received from the Sturgis Trust, Arnold added. CONWAY, Ark. (February 15, 2013) – Dr. J. Timothy Cloyd today is stepping down as President of Hendrix College after 12 years in that position. The announcement was made at the February meeting of the Board of Trustees, where it was also announced that, after a sabbatical, Dr. Cloyd will return to the Hendrix faculty as a professor in the Department of Politics and International Relations and work in higher education consulting. Dr. Cloyd became the 10th President of Hendrix in October 2001 after serving as Vice President for College Relations and Development for five years. During Dr. Cloyd’s presidential tenure, the College launched Your Hendrix Odyssey: Engaging in Active Learning, which brought significant national recognition to Hendrix as a national model for engaged learning in higher education. As a result of Odyssey, Hendrix received national media attention, including being featured on the front page of the New York Times and named one of the country’s “Up and Coming” liberal arts colleges by U.S. News & World Report for five consecutive years. Also during Dr. Cloyd’s tenure, the Hendrix student body and faculty grew by almost 40 percent and Hendrix successfully completed a $100 million comprehensive campaign, the largest in the school’s history. As a result, Hendrix significantly increased student financial assistance; endowed innovative academic, co-curricular, and student life programs; and developed state-of-the-art facilities for art, science, literature and language, wellness and athletics, and student life and technology. The College also increased student housing by constructing student apartments above the mixed-use buildings in The Village at Hendrix, a New Urbanist community adjacent to campus that began during President Cloyd’s tenure. Hendrix also played a lead role in the formation of the Rwanda Presidential Scholars initiative, with the support of the William Jefferson Clinton Foundation, and launched the Miller Center for Vocation, Ethics, and Calling and the Crain-Maling Center of Jewish Culture. President Cloyd described his decision as part of the natural cycle. Hendrix alumnus W. Ellis Arnold III, Executive Vice President, General Counsel and Dean of Advancement, will serve as Acting President during a national search for Dr. Cloyd’s successor. Founded in 1876, Hendrix College is a national leader in engaged liberal arts and sciences education. For the fifth consecutive year, Hendrix was named one of the country’s “Up and Coming” liberal arts colleges by U.S. News and World Report. Hendrix is featured in the 2012 edition of the Princeton Review as one of the country’s best 377 colleges, the latest edition of Colleges That Change Lives: 40 Schools That Will Change the Way You Think about Colleges, Forbes magazine’s annual list of America’s Top 650 Colleges, and the 2013 edition of the Fiske Guide to Colleges. Hendrix has been affiliated with the United Methodist Church since 1884. For more information, visit www.hendrix.edu. Hannah McWilliams ’13 has been chosen as a Society of Physics Students 2012 Leadership Scholar for her academic performance, strong interest in continuing to pursue physics, and her involvement in the Society. Following her graduation from Hendrix, McWilliams plans to go to graduate school in aerospace engineering. Dr. Todd Tinsley, the Society of Physics Students advisor on campus, believes McWilliams has earned the award. Rachel Thomas ’14 is an English studies major from Fayetteville, Ark.